James Tissot (1836-1902), October (1877), oil on canvas, 216 x 108.7, Montreal Museum of Arts, Montreal, Canada. Wikimedia Commons. If you have visited a provincial gallery in the UK, you will probably have stumbled across paintings by James Tissot, a contemporary of the Impressionists who seemed to paint lots of fashionable women in fashionable clothes, a bit like Alfred Stevens. Since his death in 1902, his work first fell into deep disfavour, but in the late twentieth century became more popular again. In the next few articles, I am going to try to discover the real James Tissot, and show a more representative range of his work. This introduction will hopefully whet your appetite. 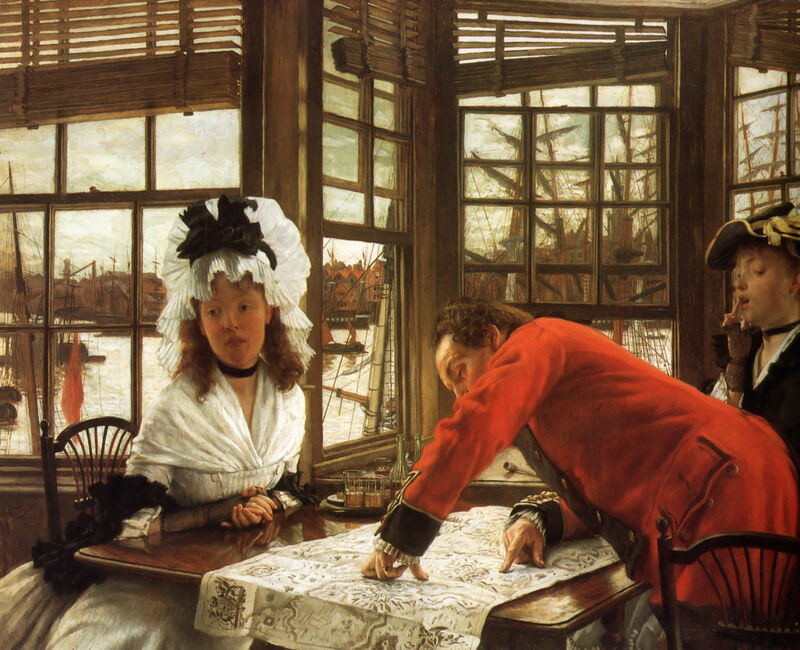 Jacques Joseph Tissot was born in the busy port of Nantes, France, in 1836. His father was a prosperous draper there, and the family was devoutly Catholic, and dealt daily with women’s fashions and apparel. The young Tissot resolved to become a painter when he was seventeen, but it took a further three years before he could persuade his family to allow him to go to Paris as a student. He had also become an Anglophile, and adopted the name of James at about that time. In Paris, he first stayed with a family friend, the painter Élie Delaunay (1828-1891), and studied under Hippolyte Flandrin (briefly) and Louis Lamothe (for several years), both former pupils of Ingres. Tissot visited Italy, and copied assiduously in the Louvre. Although Lamothe’s work is now forgotten, he also taught Degas, and made Tissot technically brilliant. He also became friends with Whistler, Degas, and Manet. James Tissot was first successful in submitting to the Salon in 1859. At that time, he had a fascination with the Middle Ages, which dominated his choice of motifs. 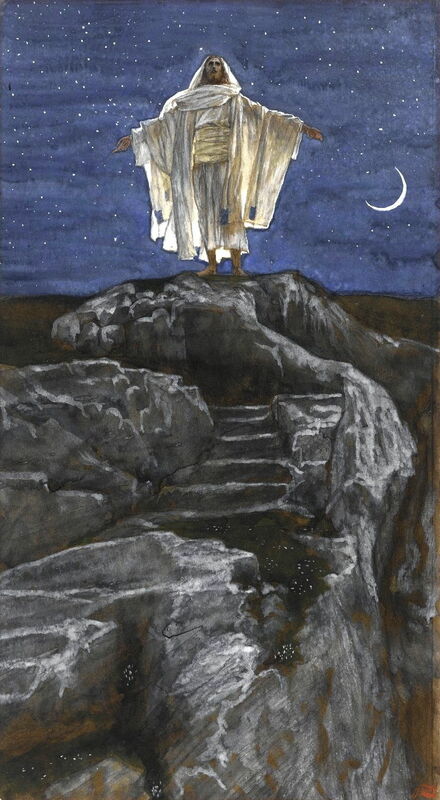 He painted a series of scenes based on Goethe’s Faust. In this he was influenced by another largely forgotten painter, the Belgian Baron Henri Leys (1815-1869). Tissot loved this historical romanticism, which was becoming popular in the work of Delaroche, Gérôme, Ingres, and the Pre-Raphaelite Brotherhood in the UK. 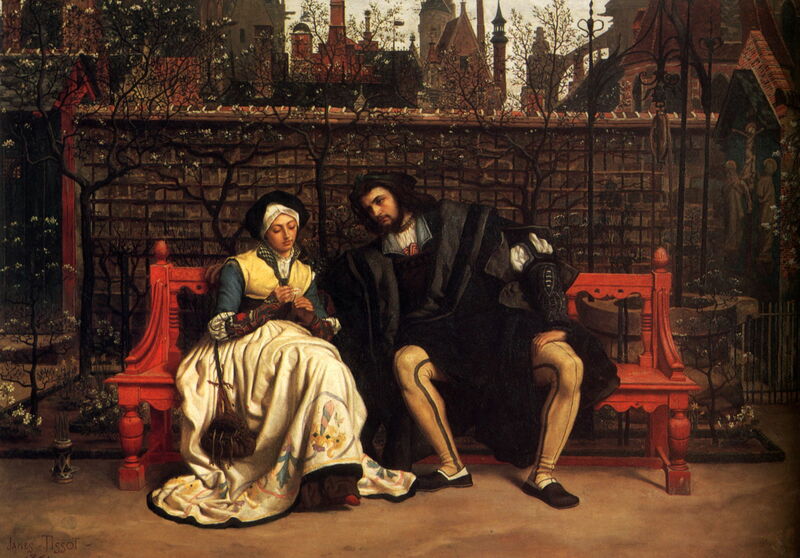 For example, in 1860-1, he painted no less than seven works devoted to Faust and Marguerite. By 1863, he was moving on from Faust, Marguerite and the influence of Leys, and painted as series of much-admired works based on the theme of the prodigal son. 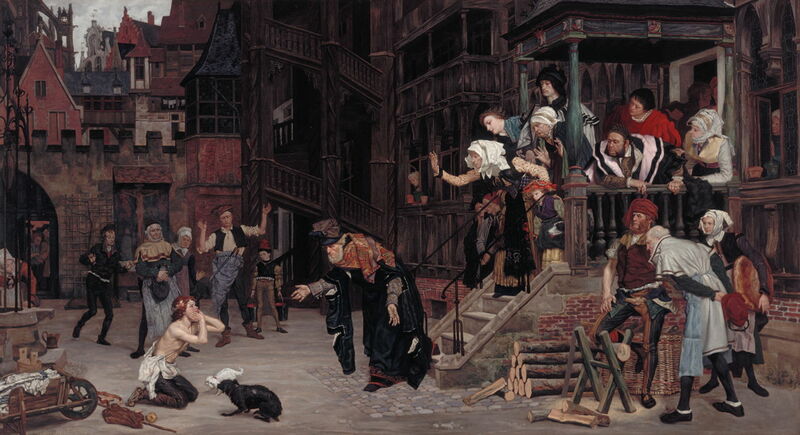 James Tissot (1836-1902), The Return of the Prodigal Son (1862), oil on canvas, dimensions not known, location not known. Wikimedia Commons. He then abandoned formally narrative painting and started to paint scenes from modern life. In this he was influenced by the paintings and success of Alfred Stevens, and threw himself into Japonisme too. He was so accomplished in his Japonisme that in 1868 he was appointed drawing master to Prince Akitake, the younger brother of the last Tokugawa shōgun. James Tissot (1836-1902), Japanese Woman Bathing (1864), oil on canvas, 208 x 124 cm, Musée des Beaux-Arts, Dijon. Wikimedia Commons. 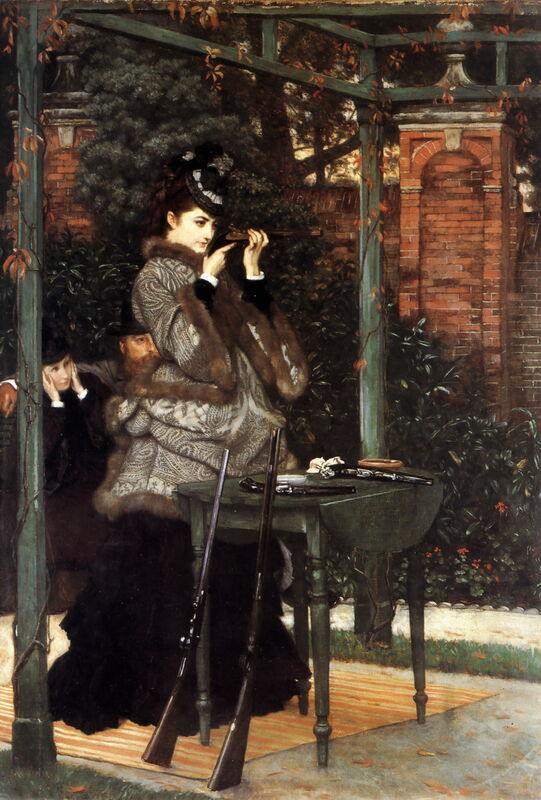 James Tissot (1836-1902), At the Rifle Range (1869), oil on canvas, 67.3 x 47.6 cm, Private collection. Wikimedia Commons. Tissot’s life changed dramatically with the Franco-Prussian War in 1870. He served in the National Guard in the defence of Paris, following which he may have become involved in the Commune, perhaps to protect his own property. When the Commune was suppressed, Tissot fled to London, where he arrived in June 1871 with just a hundred francs to his name. James Tissot (1836-1902), An Interesting Story (c 1872), oil on wood panel, 59.7 x 76.6 cm, National Gallery of Victoria, Melbourne, Australia. Wikimedia Commons. In London, Tissot started with drawings and caricatures for the magazine Vanity Fair, and quickly established himself painting the portraits of men. In 1872 he had two paintings exhibited at the Royal Academy, and his career and business took off. Several of his paintings from this period had underlying, and usually moralising, narratives. He also started to paint on and around the River Thames, following Whistler’s lead, then shipboard scenes often involving migrants, a highly topical theme at that time. 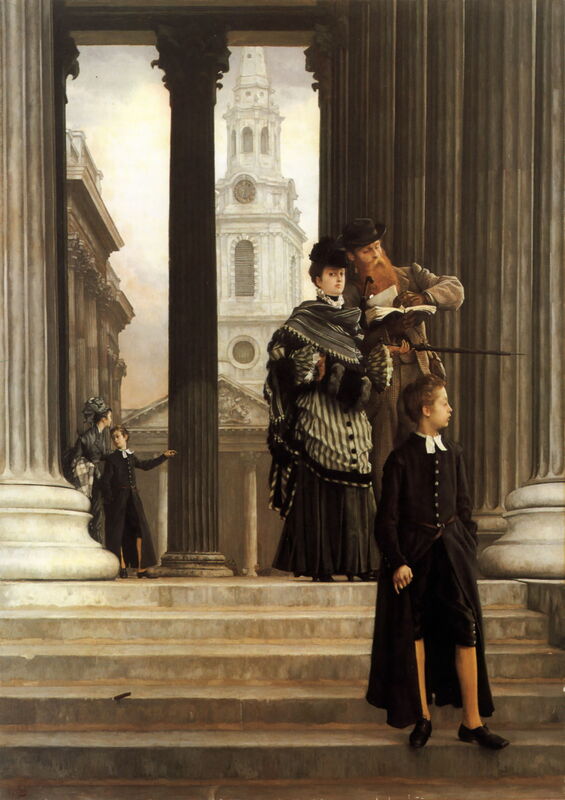 James Tissot (1836-1902), London Visitors (c 1874), oil on canvas, 160 x 114 cm, Toledo Museum of Art, Toledo, OH. Wikimedia Commons. By the mid 1870s, Tissot’s paintings were highly valued but often scorned by the critics, being dismissed as showing ‘vulgar society’. In 1876, he met and fell in love with Kathleen Newton, a beautiful young divorcee who became his model and muse. Tissot developed his reputation for fine etchings too, and his prints are of uniformly high quality. In 1882, he held a one-man exhibition at the Dudley Gallery, London, containing only eight of his paintings, but his entire output of etchings, and twenty-one pieces of cloisonné enamel. 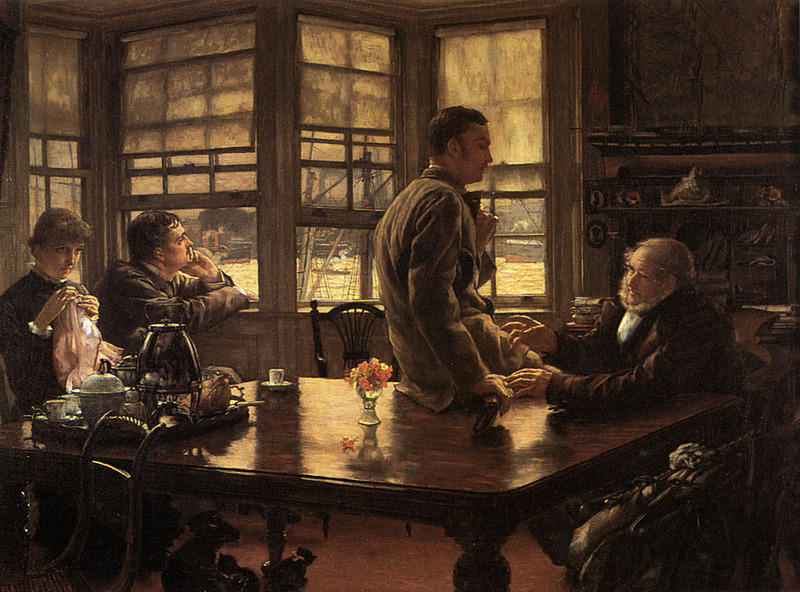 James Tissot (1836-1902), The Prodigal Son in Modern Life: The Departure (c 1882), oil on canvas, dimensions not known, Private collection. Wikimedia Commons. Among his paintings of 1882 was another series based on the prodigal son story, quite different from his first back in the 1860s. These may have been inspired by Frith’s narrative series of the time. However, fate intervened again in Tissot’s life, when Kathleen Newton died of tuberculosis in late 1882, at the age of 28. Within a few days, he abandoned London and returned to Paris. He quickly arranged a one-man exhibition with which to kickstart his career there. Although far from being a flop, his paintings had a lukewarm reception, and it was his pastels which proved more successful – he had only started using pastels seriously since his return to France. He responded with a series of large if not monumental paintings of Parisian life, which eventually proved more successful overseas than in Paris. 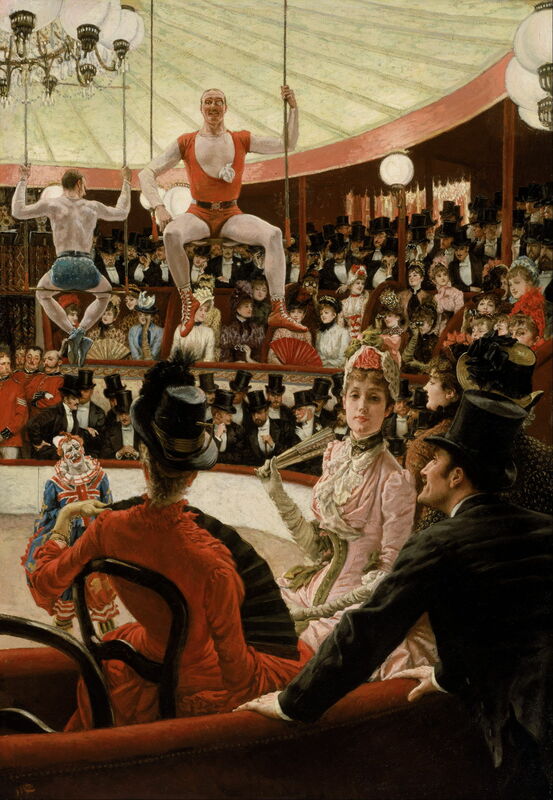 James Tissot (1836-1902), Women of Sport (The Amateur Circus) (1883-5), oil on canvas, 147.3 x 101.6 cm, The Museum of Fine Arts, Boston, MA. Wikimedia Commons. 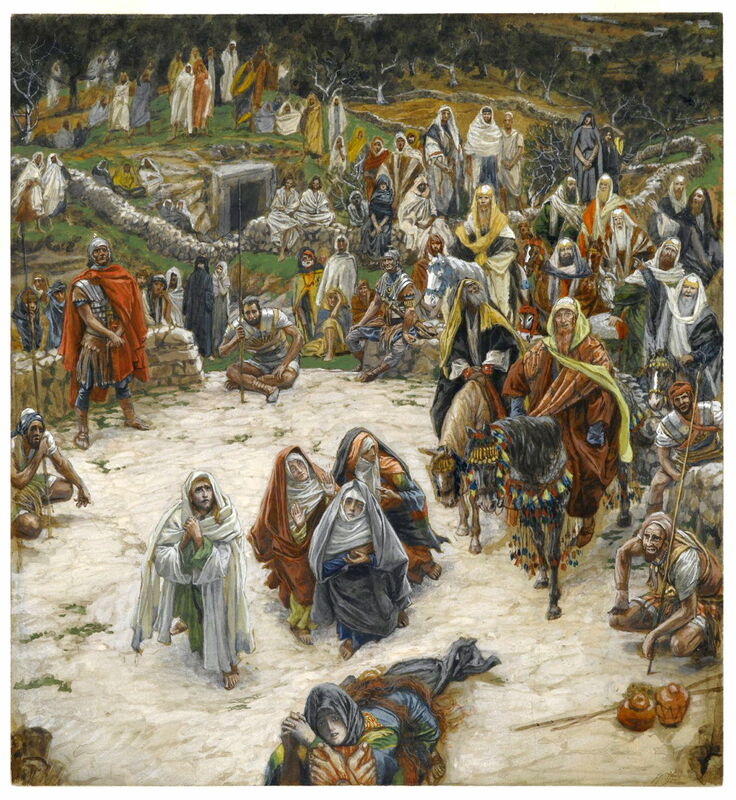 In 1885, Tissot re-discovered his Catholic faith, and embarked on the most ambitious project of his career, to paint the whole of the the life of Jesus Christ in more than 350 gouache paintings. This coincided with some experiments with the spirit world, and efforts to contact his dead lover. Over the next decade, Tissot travelled to research locations and period details, and started this enormous task. In the spring of 1894, 270 of his paintings were exhibited in Paris to massive public acclaim. This show visited London in 1896, and toured America in 1898. The whole series of 350 paintings was then published, first in Paris then overseas, in a series of editions lasting until 1910. The critical view was mixed at best, but this was the greatest commercial success of Tissot’s career. 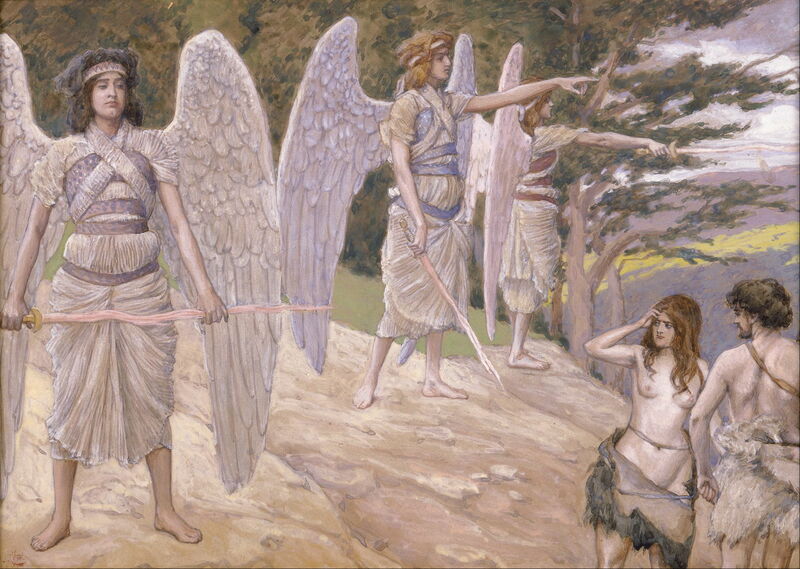 In his final years, Tissot worked on a series showing scenes from the Old Testament, of which he had completed almost a hundred when he died suddenly in 1902. Within a year, his paintings had collapsed in value, and by the 1920s he had been largely forgotten. Posted in General, Painting and tagged Degas, Delaroche, Gérôme, Ingres, japonisme, Leys, Manet, painting, Stevens, Tissot, Whistler. Bookmark the permalink.